Entrance to the River Safari. 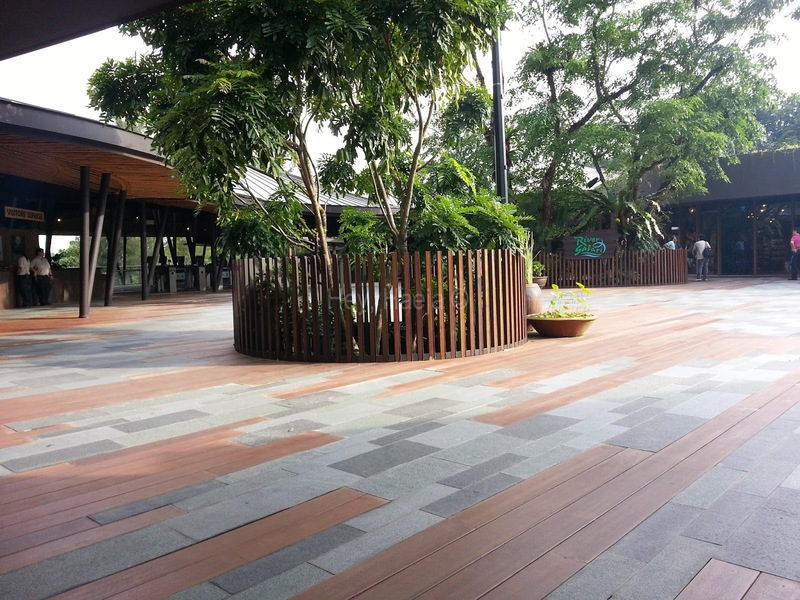 The floor is a mixture of wooden slats and cement tiles. On my first visit to Singapore last year, I had all these places I wanted to go to. I don’t really like re-visiting a country I’ve been to, since I want to visit a new country the next time. 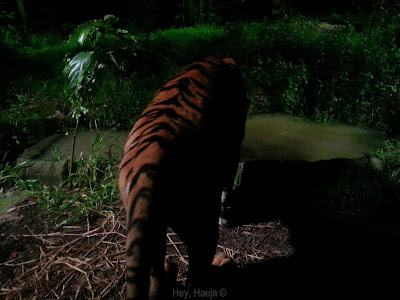 One of the places I really wanted to visit was Singapore’s Night Safari, and this time I managed to persuade my sister and mom to take the trip. We were so excited because it would only cost us S$39 for two trips. But when I got there, I had to pay $49/pax; I think the lady at the desk thought I was a local because she didn’t ask for my passport. I realized it too late – only when I got back to our hotel, Grand Park City Hall. If you are able to ride the red train line, get off at Ang Mio Kio. From Ang Mio Kio train stop, go down one floor below and exit the building facing the bus station. Cross the street to the bus station. Keep in mind the places where you can cross, of course. Enter the bus station via the stairs at the side of the building. You have to ride Bus 138, and the trip costs S$1.90 one way. If you don’t have a bus/train pass and are paying by cash, best to make sure you have coins prior to boarding as they do not give out change. You can buy a bus pass at the station if you do not have coins or the exact amount. Enjoy the scenery. You will see the housing apartments, and several beautiful stand-alone houses along the way. There is also a lot of grass, and there is also a beautiful lake that looked so inviting, I wanted to swim in it. It actually looks untouched…or just very well preserved. It’s a part of Singapore that I didn’t think actually exists. There will be many stops along the way, but don’t fret, you’ll eventually see the banner/logo announcing the River Safari/Night Safari/Singapore Zoo. Once you get off the bus, go do the River Safari or Singapore Zoo first as the Night Safari does not upon until 7pm. 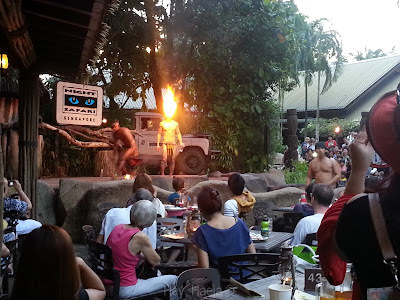 We didn’t go to the Singapore Zoo, but the River Safari closes by 6pm. 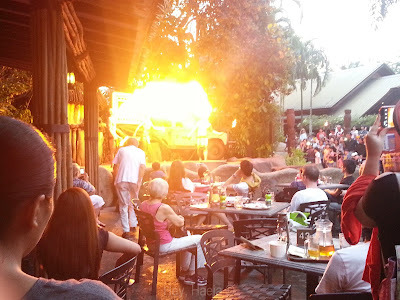 …because there’s a fire dance show prior to the opening of the show. If you missed out on the 6:45pm show, don’t fret, there’s also a show at 8pm and 9pm every day, and at 10pm for Friday, Saturday, and eve of Public Holidays. The show was okay, but I’ve seen better from Boracay’s fire dancers, which I super enjoyed. So, let’s backtrack to River Safari first. 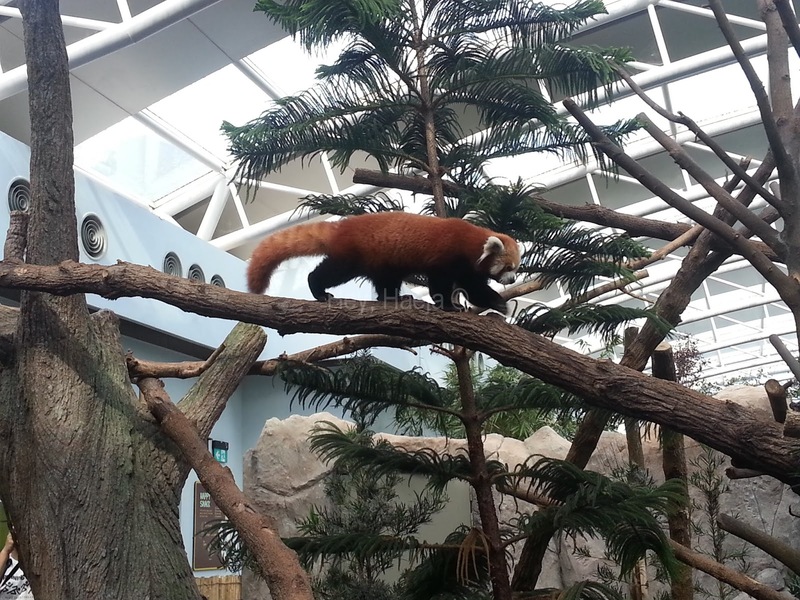 In truth, I only wanted to visit River Safari for a glimpse of real pandas, but there were also other creatures there that I enjoyed seeing. Sorry, I forgot to take note of the names of the animals! By the way, if you’re carrying a lot of stuff, like we did since we came from shopping around Orchard, there are lockers available at the River Safari for S$3 for your whole stay there. Unfortunately, you can only close it once. If you open it again, you have to pay another S$3 so make sure you have everything you need before you close it. Meet Kia Kia. 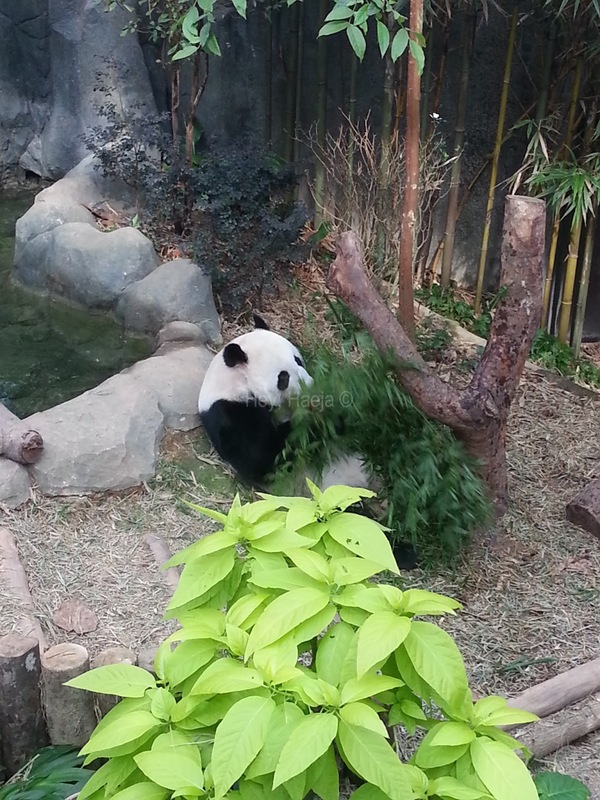 There are two panda bears in the River Safari, and Kia Kia is the more outgoing of the two. Jia Jia, the other panda bear, was hidden in their room – something she usually does when she is stressed out by the size of the crowd. It was so sad to see her eating like she was stress-eating. Prior to entering the panda place, we were warned to keep quiet and not make unnecessary noises and to turn our mobiles phone into silent mode. Jia Jia hides so frequently that the management has installed a CTV camera so people will still be able to see her. After the panda place, which is in the middle of the River Safari, there are also other interesting animals like some monkeys and other birds. The usual price of the River Safari is S$35, but since the boat is not operational yet, it costs S$25. 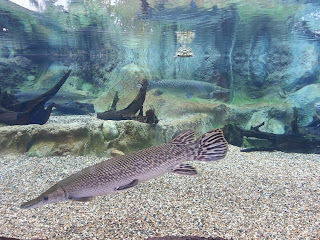 Honestly, I think it’s better to wait for the boat ride because walking around and seeing the fish is vastly different from riding in the sea and seeing them swim around you. You are allowed to bring food and eat in designated places. Equip yourselves with a lot of water as you will be very thirsty. 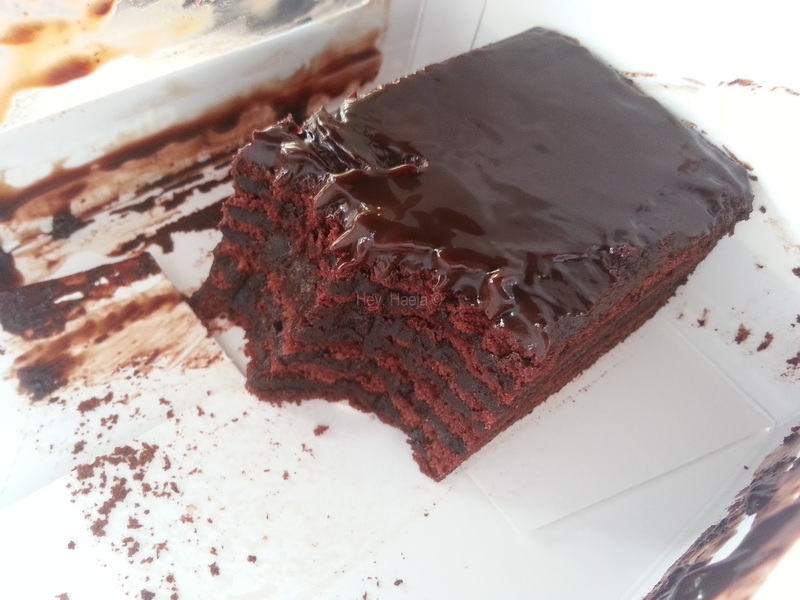 I bought this lovely-looking chocolate cake from Awfully Chocolate in Ion Orchard prior to going here. The seller only quoted me the price of the 100-gram cake, and I forgot that they also add GST, so in total I paid a whopping S$9+, when the quoted price was about S$7+. I’m just glad that the cake was tasty and not too sweet, the kind that will make your throat itch. It was also very soft and had chocolate cream in between layers. I was too busy eating before I remembered to take a photo. Sadly, the cake kept rolling around the box due to poor handling – by me – so it doesn’t look as appetizing anymore as it did on the store display. 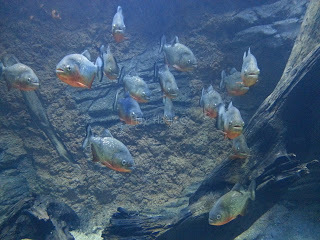 After eating, we went to the Night Safari, which is just beside River Safari. 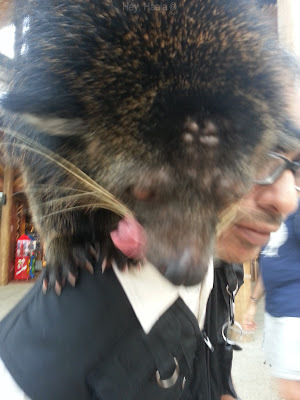 There was a bearcat, and we were allowed to take pictures with it…for free! I like bearcats because they are a combination of two animals I like: bears and cats. 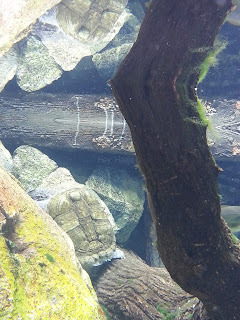 I didn’t dare touch it though because I’m not sure of their temperament. This is blurry because I moved when it kept moving closer to my phone, licking its lips like that. Upon entering the Night Safari, you can watch the Creatures of the Night Show, which lasts 20 minutes. It is a daily show in their amphitheater, from 7:30pm, 8:30pm, and 9:30pm, and 10:30pm on Friday, Saturday, and even of Public Holidays. Seats are on a first-come first-served basis so if the place is full, you won’t be allowed to enter anymore. 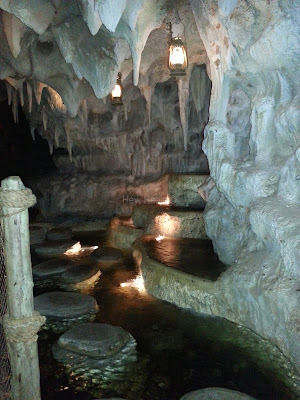 You can take a tram ride or walk the trails. We opted for both. We met a Filipina employee who suggested we watch the Creatures of the Night Show (we weren’t able to catch any of the shows, they were always full!) and then do the lion trail first then the tiger trail to watch their feeding sessions. Lion feeding session: 8pm and 9pm; Tiger feeding session: 8:30pm and 9:30pm. Each trail takes about 20 minutes and you will be able to walk from one session to another with time to spare. We got lost on the way to the tiger session. 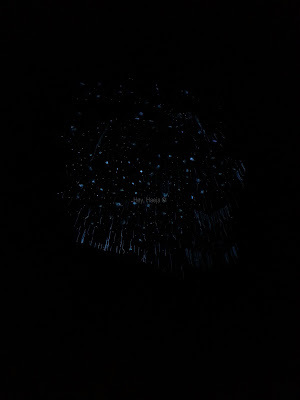 We passed through an ally where there was no lighting, and I had to use my phone’s flashlight app to light the way. We reached the Wallaby cage…which I wasn’t sure we were supposed to enter because we were the only ones there and there was barely any lighting. The wallabies didn’t pay any attention to us, though, they were too busy eating. It was too dark to take pictures and I didn’t want to use my flash, of course. We just kept on walking on the quest for the tiger lookout to watch him eat, and we chanced upon this cave with these hanging from the ceiling. I am not exactly sure what this is. Then we saw a sort of waterfall with stepping stones. My sister and I could not resist crossing the stones, despite our holding a camera and the possibility of slipping. Oh, what the heck, we are always both up for an adventure when we’re together (such as walking along the Skyway and passing by the toll booths on foot and running in the parking lot thru a pouring rain and shopping our hearts out afterward because I didn’t want the night to end yet). 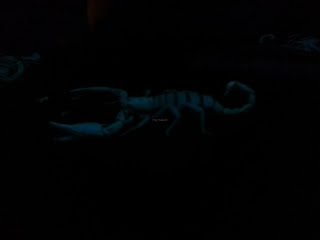 It’s a glow in the dark scorpion! 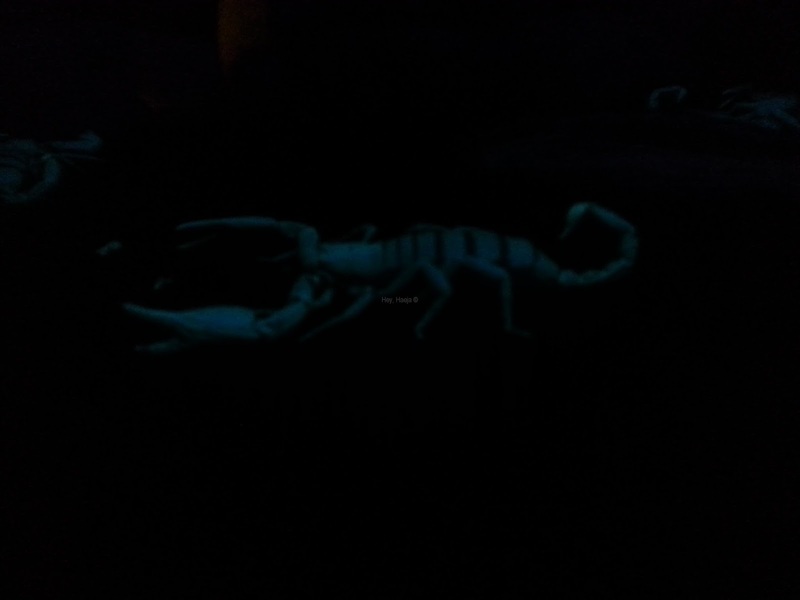 We walked through that place pretty quickly because we were feeling chilled, surrounded by live scorpions. We were able to arrive right on time for the lion feeding, but the lookout is too far for a near-sighted gal like me. Plus, the tram suddenly arrived and totally blocked my view! Being a near-sighted, 5-footer really has its downsides sometimes. We rushed to the tiger trail and we managed to snag front-most spots. The upside to this for us small women is that we were able to see the tiger up close. The downside is that a lot of people kept pushing, jockeying to get to the front and there’s barely any air for breathing. Don’t fret, there’s a glass separating you from the tiger. He was fed three times while we watched. He was so thin 🙁 It was so sad to see his bones protruding from his skin like that. He also didn’t roar or whatever to drive us off. He kept slinking and hiding as he waited for his food while we all watched him stare at us. But being this close to the tiger was worth it. The tiger actually brushed against the glass right in front of me. My H&M shopping bag was pressed against the glass, and he must have thought it was food and blood. My mom suddenly jerked backward in surprise when the tiger stopped in front of us, and he moved away before I was able to take a decent photo (with no flash). We took the tram ride twice, with my sister and I exchanging positions for each trip. It only took about 20 minutes for each ride, and it felt too short. Some of the animals, like the oryx, lechwe, and Malayan tapir were just beside the road of the tram. They didn’t attack us, but just watched us or ignored us. The Malayan tapirs are funny, because they kept crossing the road, unmindful of the tram. I suppose that’s why the tram just drove slowly because the animals might be crossing the road. After that, it was already 10:30pm and we had to catch the bus and train back to Ang Mio Kio and back to our hotel. Since we were noobs in the Singapore bus department, we really had to take the train. (We later found out that there’s a bus from Ang Mio Kio to the street near our hotel *face palm*). 1) You can take the SaEx to various points around Singapore for $5 for one way. This is also an alternative way to get here if you don’t want to take the train and bus. If you opt for the bus and train, just go back to the where the bus driver dropped you off and fall in line. The fare is S$1.90 again, and get off Ang Mio Kio bus stop. If you don’t want to take the train anymore, then find out the bus stops near your hotel. If not, cross the road to the train station and take the train to your hotel. For the price we paid, S$49, I felt it was too steep because I only really wanted to see the pandas in the River Safari, and we didn’t get to stay long there. 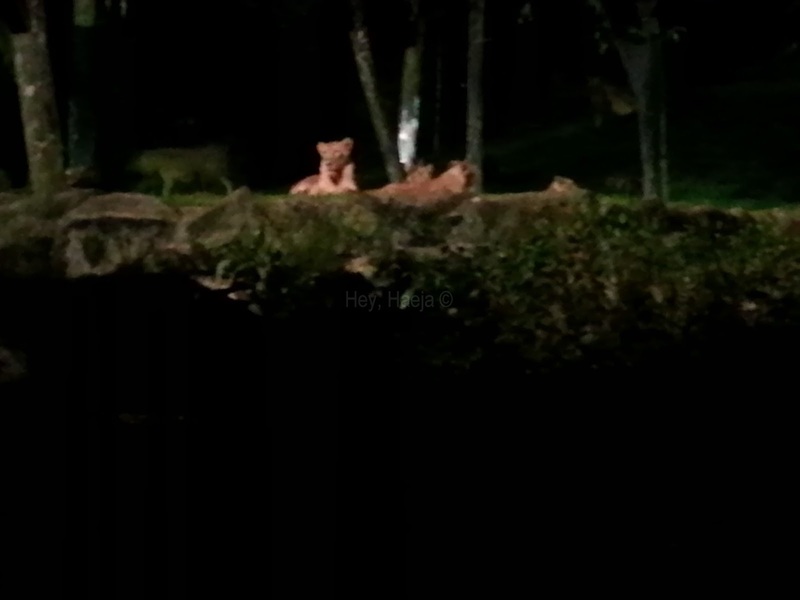 However, the night safari was worth it for me because I saw all these awesome animals up close. I felt sad though that they had such limited space to roam around, when they must have been free to roam around the world, or at least vast spaces, when they were in the wild. But that’s a debate for another day. Have you been to the River Safari or Night Safari? What was your favorite animal? The SAEx® Guide to Singapore Attractions will give visitors a bigger picture of this small island. Perhaps they may be persuaded to spend more time here and discover the various gems to be found everywhere.